Imagine you are looking at a crystal. Zoom down to the structure of atoms. Most of us would picture an ordered lattice filled with repeating blocks of atoms. So did chemists – that is until 1982 when Dan Shechtman looked through his electron microscope and saw that his crystal had an impossible structure with forbidden symmetries. His discovery shattered scientific consensus in crystallography and has now earned him the 2011 Nobel Prize in Chemistry. Before Shechtman's discovery, chemists defined a crystal as "a substance in which the constituent atoms, molecules, or ions are packed in a regularly ordered, repeating three-dimensional pattern". They believed every crystal was built from its own basic unit cell of atoms, with these identical unit cells packed neatly together to form the crystal's repeating structure. As the structure repeats periodically it has translational symmetry — you can slide the pattern along until it matches itself exactly. Chemists determine the structure of a crystal by placing it under an X-ray beam (or a beam of neutrons or electrons). 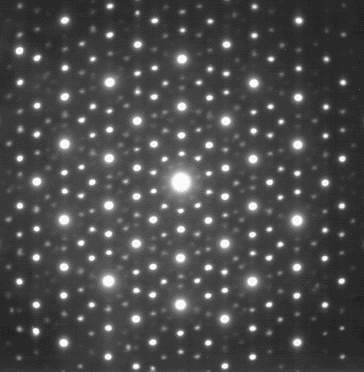 The atoms of the crystal scatter the beam to create a diffraction pattern, similar to the results of a double slit experiment. The diffraction patterns produced are very sharp because of the crystal's ordered structure. By examining the symmetries of the diffraction patterns created by rotating the crystal beneath the beam, chemists can piece together the crystal's three-dimensional structure. The mathematics of group theory is vital in chemistry as it provides the language needed to describe the symmetries of atoms, molecules and crystals (you can read more in Through the looking glass). Group theory explains exactly what symmetries are possible for a unit cell if it is to pack neatly and repetitively to make the three-dimensional crystal. If you have ever tried tiling a wall with identical regular tiles (whose sides all have the same length and same angles between them) , you will know that you only have triangles (with three-fold rotational symmetry), squares (two- and four-fold rotational symmetry) and hexagons (two-, three- and six-fold rotational symmetry) to choose from. (You can read more in The trouble with five.) Similarly these rotational symmetries are also the only possible ones a unit cell can have in order to create a repeating crystal structure. And these rotational symmetries, and only these, can then be seen in the diffraction patterns such a crystal will produce. But on examining the diffraction patterns underneath his electron microscope, Shechtman discovered his crystal had five-fold symmetry. And there is a reason you can't buy pentagonal bathroom tiles – objects with five-fold symmetry, like pentagons (or icosahedrons in three-dimensional space), don't fit neatly together (you can read more in The trouble with five). So if his new crystal had five-fold symmetry then it could not be made up of a repeating unit cells. It broke the rules, it was non-periodic; it did not have the translational symmetry that was key to being a crystal. Yet the sharp diffraction patterns revealed it did have a regular ordered structure of some kind – but what on earth did it look like? Not only had mathematicians extensively studied symmetry, but, as mathematicians are prone to do, they were also interested in how to break it. In the 1960s they began to explore the outer limits of tilings, and wondered if it was possible to tile a plane regularly, that is, with a specific set of tiles following strict rules, such that the pattern never repeated. Sets of these aperiodic tiles were discovered that could only ever produce non-periodic tilings. Initially the sets of tiles needed were huge (in the thousands) but in the 1970s Roger Penrose discovered the Penrose Tiles – a set of two tiles, one thin rhombus and one fat rhombus, that when used according to certain rules, always produced a non-periodic tiling. Penrose's tiles had many fascinating properties. There are infinitely many different ways to tile the plane using the Penrose tiles, and every possible finite arrangement of the tiles would occur infinitely many times in each and every one of these infinite tilings. And although none of the tilings has translational symmetry, they will have five-fold rotational symmetry over finite local areas, and some of these infinite tilings will have five-fold rotational symmetry globally as well. The three-dimensional version of Penrose's tiles – built from two rhombohedra – one thin and one fat squashed cube – had the same five-fold symmetry of an icosahedron. This was also the symmetry of Shechtman’s strange crystal. Penrose was aware of the potential connection to crystallography when he discovered his first non-periodic tilings which had five-fold symmetry in the early 1970s – and that a lattice of atoms following his non-peridoc pattern would disobey the standard rules of crystallography. But creating a Penrose tiling is not straight-forward: most people on their first attempts get stuck with a configuration that can't be extended any further (you can find out more about constructing Penrose tilings at Penrose tiles across the miles from the American Mathematical Society). "For this reason I was somewhat doubtful that nature would actually produce such 'quasi-crystalline' structures spontaneously," says Penrose. "I couldn't see how nature could do it because the assembly requires non-local knowledge. With my tilings you can't hope to get it right over a large area simply by placing the atoms one after the other where they 'fit'. At various times a choice would arise and to make the right choice you may have to know what's going on a long way away at the other end of the structure. If you make the wrong choice you eventually get stuck." But it seemed that nature had found a way. The chemist Alan Mackay had used Penrose's tiles to build a model of a two-dimensional crystal – a layer of atoms sitting at the corners of a Penrose Tiling. This non-periodic crystal would have five-fold symmetry and its diffraction pattern would have the same features as those produced from Shechtman's crystal. Roger Penrose's non-periodic tilings of two-dimensions, and their three-dimensional analogues, explained the structure of Shechtman's impossible crystal. "Schechtman's discovery did come as a bit of a surprise to me," says Penrose. "But as soon as Paul Steinhardt [one of the physicists responsible for making the connection between Mackay's model and Shechtman's diffraction pattern] showed me the diffraction patterns that Shechtman had found and that he (Steinhardt) had calculated I was happy to believe that nature had found a way around the problem." At first the chemistry community refused to believe Shechtman’s discovery – crystals could not have this strange quasicrystal structure. Shechtman was ridiculed for having made a foolish error, he was even asked to leave his research group as his research had become an embarrassment. But his work slowly became accepted as more chemists realised that what they had thought were errors in their own experiments were in fact quasicrystals too. Shechtman had discovered a new type of crystal structure and the definition of what was a crystal had to be rewritten. 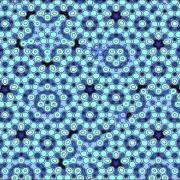 More and more quasicrystals have been discovered, including those with eight- and ten-fold symmetries. And a naturally occurring quasicrystal has even been found in the mineral deposits in a Russian river bed. Shechtman had revolutionised chemistry and his Nobel prize is well deserved. But understanding the structure of quasicrystals was only possible thanks to Roger Penrose's discovery of that beautiful set of aperiodic tiles. What had started out as a mathematical idea, explored by Penrose "just for fun", unexpectedly provided the answer to a question from a very different, and very applied, area of study. In Plus's view, it is a shame that the Nobel Committee did not recognise Penrose's discovery as well. You can read the original paper by Shechtman and his colleagues announcing his discovery as well as Alan Mackay's paper on his crystal made from the Penrose Tiles. You can also read an excellent discussion of Shechtman's work on the Nobel site, and you can find out more about quasicrystals and Roger Penrose and group theory on Plus. Thanks for this article. Just to mention a typo, you wrote "obects" instead of "objects". That was soon fixed and updated!